Food is what fuels us in so many different ways. 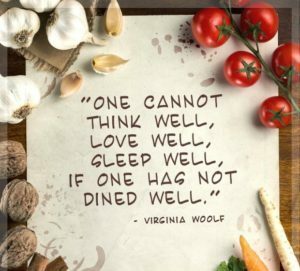 Eat well, and in turn you feel well, physically, mentally and emotionally. Today I want to share with you one of my new favorite recipes. Now, please understand, before I tried this, we avoided tofu in our house like the plague. We tired cooking with it before and the results were NOT good. There were many dinners that ended up in the garbage disposal or trash (we don’t have a dog, so that wasn’t an option!) After many years, I decided that it was time to try again. This time I did my homework and figured out a few tip and tricks that ended up making all the difference. 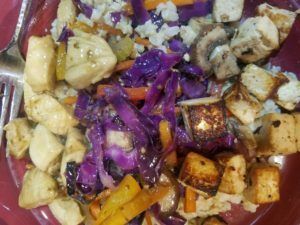 Tofu is one of those amazing foods that will take on the flavors in whatever you combine with it! A good marinade goes a long way! This particular marinade has a nice sesame ginger flavor to it and is perfect for those fofu newbies! 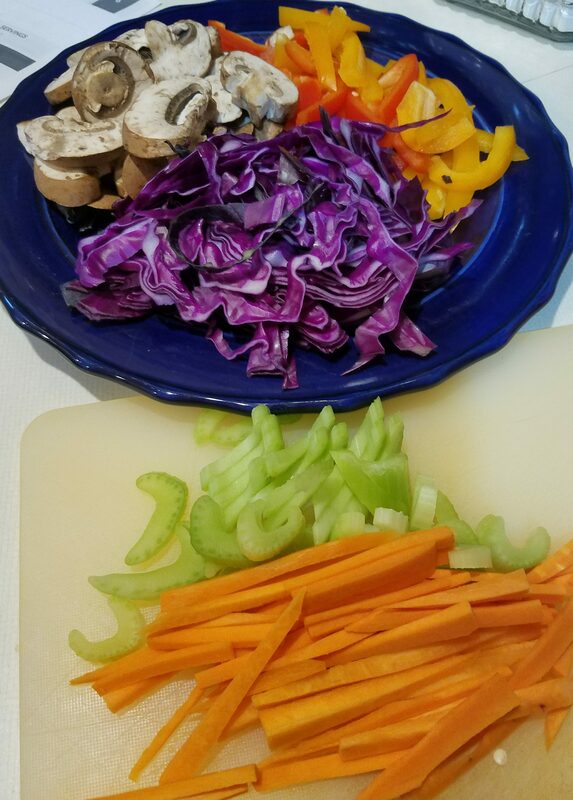 This stir fry has both tofu or chicken options, but the best part is that you use the same marinade, not matter which protein you choose! 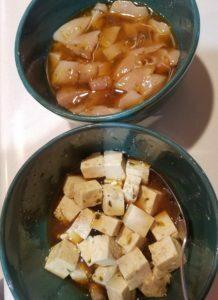 Since this was the first time using this recipe, as well as first time in years using tofu, I made both options. I simply made 2 batches of the marinade, one for each protein, to keep them separate so the picky eaters could choose which one that wanted and how much. Wisk everything together and set aside. This was one of the easiest marinades ever! I did have to use ground ginger in mine, as I was not able to find Ginger Juice in my grocery store… anywhere! Anyone out there know where in the store I might find this? tell me! I really want to see how that changes the flavor (if at all) of this recipe! 2. Set tofu/chicken aside and prepare Basic Marinade. 4. Heat olive and sesame oils in a skillet. 6. In separate pan, Coat a skillet with the peanut oil and cook onion and carrot over medium heat until tender. 7. Add cabbage, season with salt, toss, cover,and cook for 5 minutes. 8. Add bok choy and bell pepper, cover,and cook 2-3 minutes. 9. Season with toasted sesame oil and salt to taste. For an added zip of flavor, save some of the marinade from your tofu to drizzle on to the top after plating! Please do not use remaining marinade from the chicken this way – remember, your raw chicken was in there. I don’t want to get you sick! I have deviated from this mix of veggies in this dish several times. It all depends on what I have available! As you can see from the photos, this time I added mushrooms and celery to the mix. Broccoli and or zucchini is also a good option I also have to leave out the onion, since that is on my list of foods to avoid, but honestly, I don’t even miss it! There are so many other fresh flavors in here that the taste buds don’t know any different! There is no right or wrong answer when it comes to the veggies that you decide to use… unless you don’t use any! Then we might have to talk! So go ahead, give it a try! 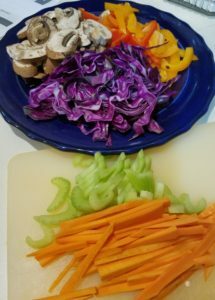 If you have never tried tofu, go for it! You never know what the result will be! 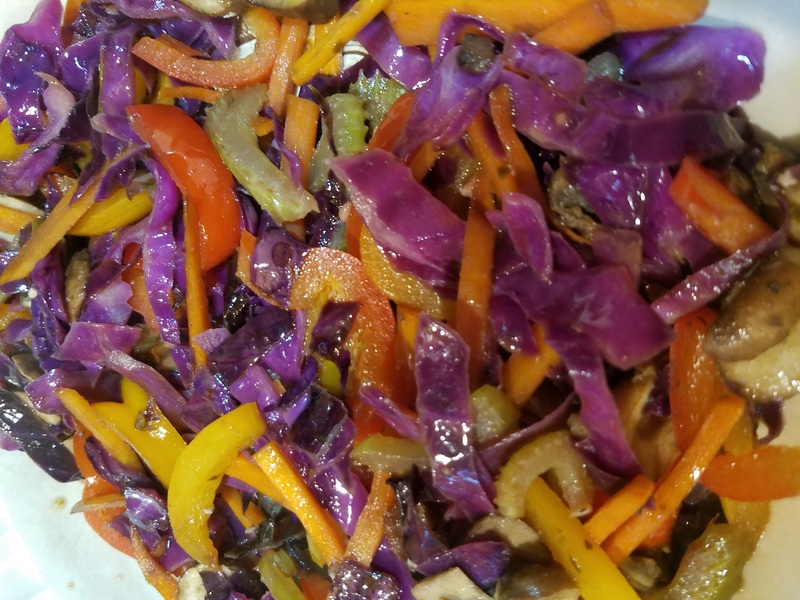 In the end, even my uber finicky husband said that he would eat the tofu again… he just requested that I also make the chicken as he felt that just the tofu would not be enough. Fair enough! I can live with that!